The trailer for the highly anticipated Cowboy Bebop movie, Knockin' on Heaven's Door, starts out with the Bebop casually drifting in space before quickly cutting to Jet Black and Spike Spiegel walloping some sunglass-clad fellow in a convenience store-esque setting. Spike spins his gun on his finger. The trailer then fades into the red and black Cowboy Bebop logo. After that, a bearded man walks in front of a major explosion with several cars being thrown in the chaos. 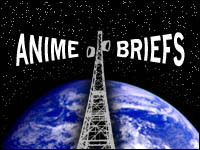 The Cowboy Bebop logo flashes vertically, with the words "A Man in Secret". The next scene places Jet at his computer, shocked by some organic process. The vertical logo flashes again, this time with the words "Unidentified Virus". 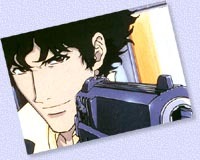 Following that, Spike is shown with his trademark cigarette and a bearded, somewhat Arabian-looking character. They both are on a Moroccan street. The subtitle for this scene change is "Mysterious Town". After that, the bearded man from the explosion is seen talking with a mysterious dark-skinned character. The title is "Biological Terrorist". After that, there are several scenes of a train and a computer system (seemingly being taken over, highly reminiscent of Evangelion). After that, both the bearded man and Spike are on a train, each one holding the other at gunpoint. The bearded man fires a shot and Spike dodges. The scene changes and Cowboy Bebop's opening theme "Tank!" blares as Spike dodges a flying punch and a hat goes flying off of his head. He whacks his attacker, a black haired woman wearing black pants and an orange jacket, with a broom. The scene seems to be one of the classic CB martial arts fight scenes, along the lines of the Spike/Asimov fight of episode I. The next scene has the bearded man holding Faye's face with a bloody hand and stooping down to kiss her. Then he licks the blood off of his fingers. Cut to Ein stretching out, then the Hammerhead flying through a gorge, with Spike dodging bullets in a very desert-like setting. Following, Faye's laying down, face up, as a knife is slid up her neck. The next scene has the bearded character reaching for Spike's face and each one speaks, before the bearded man presses on some button or container. There are several conclusions to be made from the trailer. The major plot seems to revolve around the bearded character releasing some sort of viral plague. Most likely Spike and Co. will be saving the universe, of course for their own benefit. The movie seems to have a very Moroccan feel. Also, even from the choppy QuickTime trailer, it seems obvious that production values are high - better even than the series, which is known for its quality animation. Overall, the trailer seems to put the movie squarely in familiar territory, but with everything that one would expect from a motion picture. Announced at AX, Pioneer's troubles for licensing the Aa Megami-Sama movie have been solved. 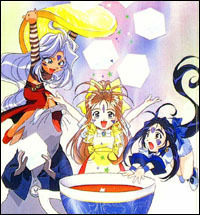 Pioneer was not allowed to license the movie without also taking the TV series, The Adventures of the Mini Goddesses (or Chibi Aa Megami-Sama). The series consists of forty some 7-minute shorts, featuring miniature versions of Skuld, Urd, Belldandy, and their rodent friend Gan-chan. Pioneer wasn't thrilled by the rather bizarre shojo series and held off on licensing it. Even though Pioneer purchased Chibi AMG, they are hesitant to release it. It has been rumored that Pioneer will instead package a "special edition" of the AMG movie with a second disc featuring the shorts. Looking for something to occupy your time while you're downloading the latest fansub off of IRC? Then why not check out Legendary, an anime-inspired web series that features a unique blending of text-based fiction with standard artwork and flash animation that includes music and voice acting. It's definitely not your average online comic. Legendary's story is presented in a series of "chapters" that are added twice a week. The tale itself is meant "to be a satire on anime and fantasy stories", as Megan Crewe explained in a recent press release. The story itself starts simply enough with a girl named Liz being drawn into a series of strange events by a mysterious young woman. The story itself is not that old, and readers shouldn't have a problem catching up on the past events, plus all the chapters are available online along with a number of other special features. Be sure to check it out at www.legendaryonline.com.